This comfortable aparthotel can be found in Sutton. A total of 50 units are available for guests' convenience at OYO Flexistay Aparthotel Sutton. 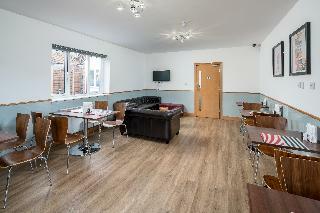 OYO Flexistay Aparthotel Sutton includes Wi-Fi internet connection in all public areas and guests rooms. The front desk offers 24-hour reception. This aparthotel does not offer cots on demand. This aparthotel is wheelchair-accessible. There are -1 disability-friendly rooms available on the premises. No pets are allowed on the premises. This lovely hotel is located in Sutton. The accommodation comprises a total of 120 snug accommodation units. Travellers will not be bothered during their stay, as this is not a pet-friendly accommodation. Boasting a peaceful location, this pleasant hotel is situated only a short distance from Sutton train station. This allows guests easy access to the countryside outside of London as well as the city centre itself. The hotel's facilities include Squiggles Lounge and Bar, 24-h room service and business services. All rooms are en suite and fully – equipped as standard. The Spirit Health and Leisure club includes indoor heated pool, spa, gym, sauna, steam room and solarium. Within the treatment rooms the professional therapists offer a wide range of treatments using Dermalogica products, plus reflexology, aromatherapy massage, hot stone treatments and bride and groom pamper packages. There are a choice of dining options, the Junction contemporary and stylish restaurant or the Lounge-Bar with Sky Sports and WiFi internet access.